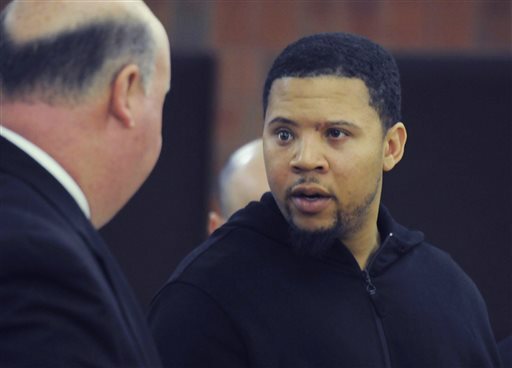 HARTFORD, Conn. (AP) — Police say a man who alleges he was shot by former New England Patriots tight end Aaron Hernandez has been shot again, this time in Connecticut. Hartford police Lt. Brian Foley says Alexander Bradley was shot several times in the leg Sunday night outside the Vevo Lounge Bar & Grill, then shot up the front of the club before being caught and taken to a hospital. He’s expected to survive. Police haven’t announced any arrests or a motive. Bradley alleges in a Florida lawsuit that he lost an eye when Hernandez shot him outside a Miami club last year. And Boston police have linked Bradley and Hernandez to a 2012 double killing, although no charges have been filed. Hernandez is detained on a murder charge in a killing near his North Attleborough, Mass., home.